The New Zealand dollar (NZD) occupies a precarious position in foreign exchange market. It is a free float currency but its small size in the giant FX market means it can be volatile during periods of extremely tight liquidity. Within the wider context it is almost like a penny stock. Price gets whipped around as the big boys pushes it around. The volatility can be attractive for traders. Periods of continuous falls driven by oversea sellers during periods of market distress and traditional carry trade candidate when the market is in risk on mode means it is favorite among many foreign exchange traders seeking risk. Market sentiment aside, on a fundamental basis we are cautious at the relative strength of the Kiwi dollar verses Australia and US dollar. For those that are looking for commodity exposure through FX instruments. In the instance of AUD vs NZD, the key question is which represent the best candidate to go long or short to ride the commodity sentiment. From our viewpoint, the Australian dollar is a proxy for base commodities exposure such as copper, as well as iron ore and in the near future Liquefied Natural Gas positions. New Zealand exchange rate tracks the global dairy price. New Zealand dollar peaked against the US dollar in early 2014 at the same time when the Australian to US dollar exchange rate also reached its peak at around $1.10. The depreciation in both currencies mirrors the exact fall in value of each countries respective export commodities. In the instance of the New Zealand dollar. The drastic and fast decline was fueled by the cut in the interest rates by RBNZ. Continued negative sentiment towards diary price outlook is capping further gains of NZD. Australia is a key trade partner for New Zealand just like United State’s economic importance for Canada and Mexcio. The AUD to NZD exchange rate plays a critical role in pricing the relative value of trade going back and forth across the Tasman. As opposed to the New Zealand dollar against the Japanese Yen or US dollar. On a micro level given the similar legal, cultural and economic structure between Australia and New Zealand, it result in limited volatility in this cross pair. The movements in this currency pair is primarily driven by economic performance of the underlying economy. Look back in the last 5 years, and it is true historically. The AUD to NZD exchange rate is usally range bound between $1.30 to $1.00. Recently the cross rate peaked in 2011 at $1.30, and looks like it made a decent bottom in 2015 at $1.00. 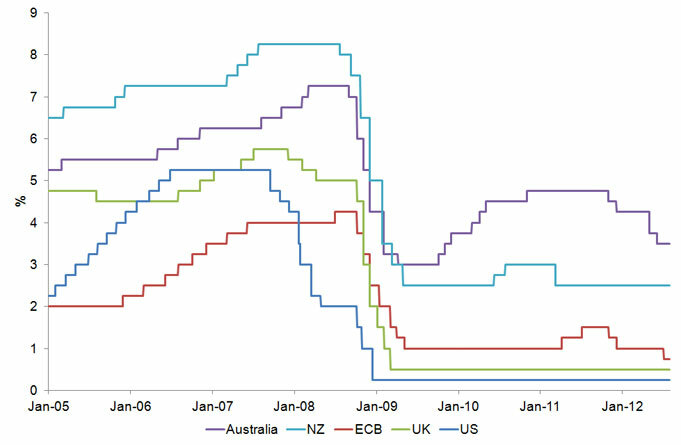 In 2011, RBA kept rates higher than other major economies. There was a large difference between Australia and New Zealand cash rate in which we felt was unwarranted. We remember selling the AUD NZD rate near the peak as a mean reversion trade but it was quite painful due since the position is negative carry. The cost of shorting the AUD was higher than going Long NZD. Although AUD/USD fell dramatically in recent years as result of the end of the commodity super cycle. The AUD to NZD exchange rate has under performed from the Australian perspective. This is because exchange rate value is a function of relative economic performance. Unlike equities, in FX. Economic fundamentals does not matter by it self but on a relative basis between economies. AUD to NZD exchange rate value is determined by the economic perception of Australia compared to New Zealand. AUD NZD rate deteriorated because the outlook for Australia is worse than New Zealand after the end of the commodity super cycle. Even taking into consideration that the New Zealand economy is heavily dependent on dairy as its key export commodity. In the case of AUD vs NZD, we have turned bullish on the AUD to NZD exchange rate as we feel better about the broader Australia economy, bar the any collapse in house prices will drive Australian out performance against the Kiwis. This includes the tailwind of potential bigger housing bubble in Auckland. On a stock specific basis. Big Four Australian Banks would be negatively impacted by the decline in the AUD to NZD exchange rate. The NZ arms of the major Australian banks provide key earning cushion for the business. Given any weakness will not help the banks to maintain current earnings. It is another reason we are cautious on the banks in the short and medium term.